Bobâ€™s Red Mill, Beans, Cranberry Beans Have Been Enjoyed As A Delicious Source Of Protein, Fiber And Iron. These Cranberry Beans Have A Velvety Texture And Mildly Sweet Flavor That Some Liken To The Taste Of Chestnuts. 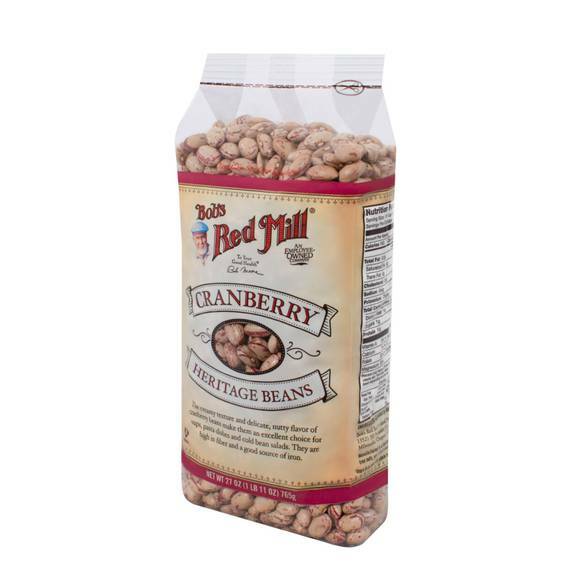 The Creamy Texture And Delicate, Nutty Flavor Of Bobâ€™s Red Mill, Beans, Cranberry Beans Make Them An Excellent Choice For Soups, Pasta Dishes And Cold Bean Salads. Please See Nutritional Facts Panel For Information On Possible Allergens. Bobâ€™s Red Mill, Beans, Cranberry Beans Are Manufactured In A Factory That Also Processes Soybeans, Milk, And Tree Nuts.